Dark days, Greenwich Mean Time, Christmas hurtling nearer? The only time I ever manage to write a novel is in November. And this is in no small part to the power of on-line community – not just of Wrimos themselves (Wrimos = participants), but of all those who are aware of it happening. Friends on Facebook and Twitter constantly cheer you on. 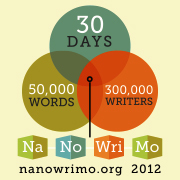 Your little word count meter on theNaNoWriMo site goes up (this in itself is oddly motivating). These friends of course have varying beliefs, but as part of the Association of Christian Writers, I also know there is a little group of ACW members attempting it – and on our group Facebook page, jokes and encouragement abound. Some do write specifically ‘Christian’ fiction. Others, like me, are not aiming particularly for a Christian audience. There’s a wide range of genres…romance, thriller, mystery, humour and parody… As for me, I describe mine as ‘quirky’, for want of a better word. What on earth has this got to do with #digidiscipleship? How might we harness this sort of driving force in our digidiscipleship? Is it possible? We are, after all, a motley group of people engaged in a sole pursuit – following Jesus. New media brings us together in different ways – ways that were impossible 10 years ago. How can we use all these new resources to encourage people in their journey of faith? NaNoWriMo brings out the best in people. Rarely do you come across a tweet that says ‘you’re not good enough’ or ‘you’ll never do it’. It’s all about encouragement. Do we use Twitter et al to encourage, and not discourage? Or, in our attempts at ‘being right’ or ‘making our point’ – are we in effect getting out our metaphorical red pen and scribbling over someone else’s manuscript – before it’s ready for that kind of scrutiny? Let’s remember the purpose of our pursuit. We won’t all agree on everything. Some things will be difficult to resolve, and may never be this side of New Creation. But amid all this, let’s fix our eyes on Jesus. Let’s press on towards the goal, knowing we have a ‘great cloud of witnesses’ – in more ways than one.